Safety stock value added on top of the forecast value to mitigate the risk of a stock-out due to unforeseen issues in supply and/or demand. Determining the correct safety stock level is crucial to avoid stock-outs and production delays, while avoiding high inventory costs and product expiration. Manually via the Order Point Calc UI. 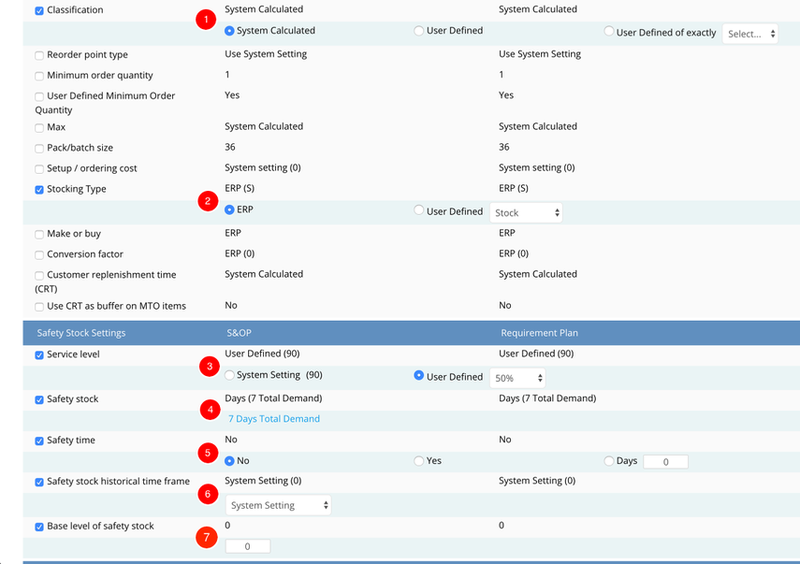 Automatically from the Supply Plan analysis when the S&OP module is enabled. Since there is no readily accepted safety stock calculation method, DemandCaster offers numerous methods for our users. The method you choose will be based on your companies unique operating needs. It is important to note that the safety stock is tied to an items stocking as well as lead time settings. Users must ensure the settings are correct in DemandCaster or else the calculations will be wrong. Stock: The item is maintained in inventory with a reorder point that is derived by a forecast and safety stock. A stocked item will have safety stock calculated based on the option chosen unless otherwise assigned. Order: The item is considered Make/Purchase to Order and is not maintained as a stocked (inventoried) item. There is no reorder point calculated thus no forecast or safety stock unless otherwise assigned. When a customer order or production order is created, the DemandCaster requirement plan will generate only the required quantity for the item taking into account any minimum order or case pack / batch size quantities assigned to the item. The logic of the safety stock calculation is not to duplicate safety stocks from finished goods to component when the finished good is carrying safety stock. This logic also applied to source to destination when the destination location is carrying the safety stock. This is because safety stock is primarily a cushion for variable demand. For some, this appears to be illogical because in most cases components have longer lead times than the finished goods as well as source has longer lead times than the transfer time to the destination. In these cases, we recommend adding a safety time value at the component level. Service Level: A single service level value applied to all items. Use System Calculated Service Levels: The service level is applied based on the A, B, or C business importance of an item. Safety Stock Type: A number of safety stock models are available by clicking the safety stock hyperlinked value to open a pop-up. The model selected in system settings is applied against all items. However, in all cases, the setting may be overwritten at the item level as described below. ERP Safety Stock: Applies the safety stock loaded in the ERP. Standard Deviation Safety Stock: Applies the weekly standard deviation of demand as the basis of the safety stock calculation. Customer Minimum Safety Stock: Applies the safety stock as provided by the customer as a minimum level of inventory. This is applied when vendor managed inventory is implemented. User Defined Safety Stock: Applies a user defined safety stock value. Days based Safety Stock: Applies a safety stock value calculated as a desired number of days of safety stock to be carried. The days are user defined and the level of safety stock is based on either a historical average, the forward forecast, or total demand value. If the forecast or total demand approach is chosen, the safety stock value varies as the value changes over time. Lead Time based Safety Stock: Same as Days Safety Stock except the value is based on a percent of lead time i.e. 50% of lead time. Critical Safety Stock Level: % to allow an items projected on hand to move into the safety stock quantity before triggering a reorder. To run a new Order Point Calculation, click generate analysis in the Order Point Calc interface. Upon completion new safety stock values will be calculated and will be applied to the requirement planning or supply planning process the next time they are run. Stock: If the item is maintained in inventory (yes) or one that is made or purchased to order (no). Stocked items will have safety stock calculated unless otherwise designated. Total Lead Time: For safety stock using lead time as the basis, the lead time value is provided. Total lead time is calculated as the selected Lead Time plus Lead Time Cushion. This value is what is used for the reorder point calculation. Forecast: The items forecast value over its lead time. Safety Time: If safety time is taken into account in the safety stock analysis calculation, the value will be reflected here. The value can be overridden at the item level under ViewDetails and Options. The choices are No (safety time set to 0), Days (shows the safety time value per day entered), or Yes (the general safety stock value for all items). The basis for days is historical demand. Total Safety Stock: The total safety stock of an item is the sum of the items applied safety stock plus safety time (if applied). SS (Days): The equivalent number of days the selected Safety Stock option is equal to using history as the basis for the calculation. This value also appears in the options tab of the requirement planning item detail view. Order Point: Calculated as forecast + selected safety stock + safety time (if applied). High Demand: The highest cumulative demand over an items lead time when measured over the Safety Calculation period in system settings. This is calculated as part of the requirement planning process. STD. DEV. SS: This is the result of the Standard Deviation Safety Stock option that can be used as a reference when other safety stock options are applied. SS as % of LT: Safety stock as percentage of lead time using history as the basis for the calculation. ERP SS: Displays the ERP safety stock value for this item. Std. Dev. SS: Shows the weekly standard deviation of the safety stock calculation. The company setting is chosen as the default calculation period. The calculation period can be overridden at the item level. User Defined SS: Displays the user defined safety stock value for this item. Days On Hand SS-History: A safety stock value calculated as a desired number of days of safety stock to be carried. The days are user defined and the level of safety stock is based on a historical daily average over the std. deviation calculation period defined in system settings. or the weekly forecasted value over lead time. If the forecast approach is chosen, the safety stock value varies over time. Days On Hand SS-Forecast: A safety stock value calculated as a desired number of days of safety stock to be carried. The days are user defined and the level of safety stock is based on the weekly Forecasted value over lead time. If the forecast approach is chosen, the safety stock value varies over time. Days On Hand SS-Total Demand: A safety stock value calculated as a desired number of days of safety stock to be carried. The days are user defined and the level of safety stock is based on the weekly Total Demand value over lead time. Total Demand is the forecast plus dependent demand. If the Total Demand approach is chosen, the safety stock value varies over time. Lead Time SS: Same as Days on Hand Safety Stock except the value is based on a percent of lead time. Either historical average for forecast may be used as the basis. SS Days: This is the value used for days on hand. Change the safety stock setting by selecting the appropriate options and then scroll to the top of the interface and click Save to apply the settings. Please note that you must run a new analysis to allow the settings to be applied. This is done in order to not effect the settings of the current analysis. Upon selecting the items to change and clicking on the edit button, the Multiple Settings Edit interface opens. The same logic as the options tab applies. 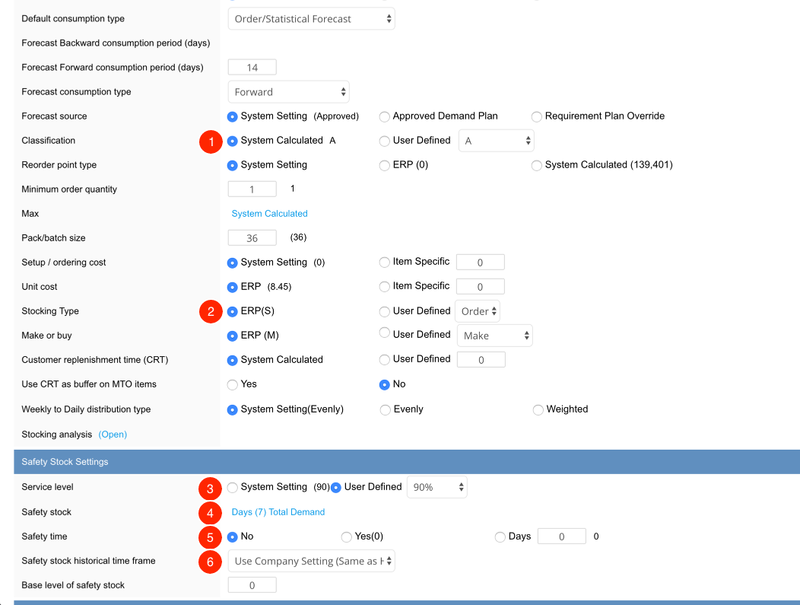 This interface also shows the value applied in S&OP and Requirement Planning. As in the options tab, you must run a new analysis to allow the settings to be applied. This is done in order to not effect the settings of the current analysis.